There is a lot of interest in Marriott Flight and Hotel Packages of late. It could be because Southwest chose to go the corporately responsible path, it could be the amazing deals out there due to the new Marriott-SPG Merger, or some fun third option. I first wrote about the Marriott Flight and Hotel Packages back when I asked the question: Is Marriott the redheaded stepchild of Points and Miles Seekers? Well, a lot has changed, thanks to the various changes we’ve seen in the travel industry. The Marriott-SPG Merger is probably the biggest driver for people to look more at Marriott, but I suspect that Chase’s Ritz Carlton credit card probably had some influence there as well. But, the tricky part, you might be thinking, is how to get all those miles? If you’re utilizing the two player game style game–but instead, applying for credit cards rather than chasing Delta Airlines status–then you might have nice balances in each player’s accounts, but perhaps not enough for the package you want. Marriott typically will let you transfer 50,000 Marriott Rewards points per year. Lets say that 50,000 points isn’t enough, what do you do? Well, apparently, it is possible to transfer more points, if it is for a specific award, and your partner doesn’t have enough miles in their account. Think a week’s stay at a category 9 hotel, or higher, or longer. Stays like that take lots of points. Hundreds of thousands of points. Kind’ve similar to the amounts of some of those packages in the photo above. 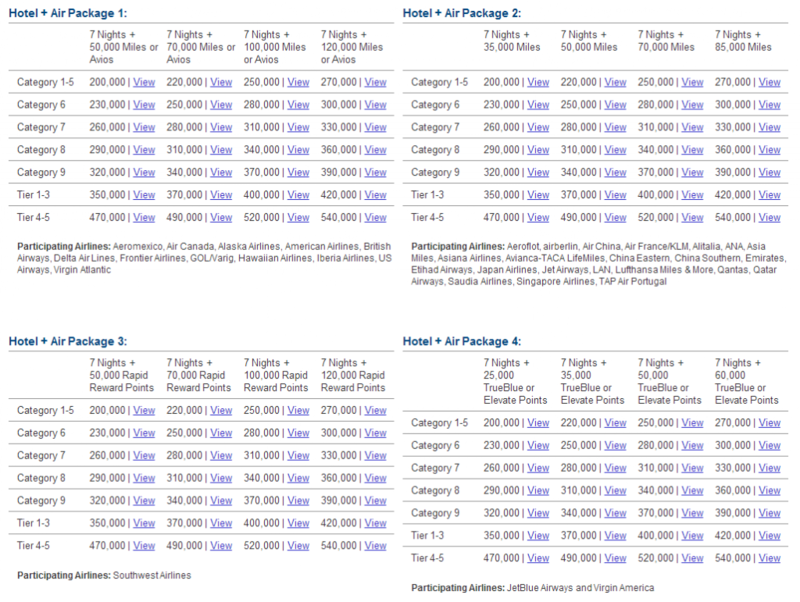 There’s a lot of opportunity with the Marriott Flight and Hotel Packages. Especially given the Marriott-SPG Merger and the 3:1 ratio (or, put differently, earn 3 Marriott Rewards per 1 SPG point). Even before the merger, this program was a great way to “rinse” your Marriott Rewards points and convert them into an airline mile currency, at, perhaps not the greatest conversation rate. Now is an excellent time to be looking at these packages.